You are currently browsing the tag archive for the ‘Zoning’ tag. Yesterday, the Department of City Planning proposed a new zoning text amendment that will require indoor, secure, long-term bicycle parking in new multi-family residential, commercial, and community facility construction. With commuter cycling on the rise in the City, this new amendment seeks to support current riders and encourage new ones, while decreasing congestion and air pollution. The DCP website outlines the details, including the fact that these bike parking areas would not count toward a building’s floor area. ULURP for this proposal will begin with review by all community boards starting November 17. 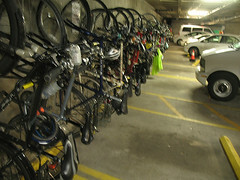 Photo of indoor bike parking at a Portland, Oregon office building by Mark Stosberg on Flickr. RSVP to Lucas at HCC: LShapiro@hcc-nyc.org or 212-716-1664. AIA Zoning Text Amendments: Explained! Last night in Midtown, planner Paul Graziano, President of the Historic Districts Council, explained the American Institute of Architects’ proposed zoning text amendments to a room full of concerned citizens, including many members of community boards from all over the city. 2) The allowance of multi-family building construction on small interior lots is proposed in the name of affordable housing creation, yet there are no accompanying regulations to ensure that the housing constructed will, in fact, be affordable. This puts people living in one and two-family homes on such lots at risk of displacement in favor of multi-unit luxury development. 3) The changes to maximum base height restrictions remove the context from contextual districts. These changes deny the charm of the varied streetscape in landmark districts, and again threaten light and air. 4) The creation of a standard waiver to abolish the side yard requirement in low-density districts is not just an issue for the outer boroughs. While it does threaten the historic, low-density building stock found in such areas as Victorian Flatbush, it also is a sustainability and open space issue for the whole city. It even contradicts the recent yards text amendments already proposed by City Planning, which would require all yards to contain some green space. Putting aside opinions about the content of these amendments, the most important issue here, from a community-based planning perspective, is process. Council Member Tony Avella, Chair of the Zoning Committee, said that the passage of these amendments could, “open the floodgates,” for other private entities, either organizations like the AIA, or – even more frightening – developers, to push through citywide zoning text changes with little to no community process. So far, there has been little chance for public input on a proposal that the AIA has been working on with the Department of City planning for the last three years. Because this is a private application, it is progressing through a process called “expedited ULURP.” The amendments were distributed to community boards in October, leaving little time for review before the busy holiday season. Now, because of community outcry, and on request of Brooklyn BP Marty Markowitz, DCP has postponed its public hearing until February 27, to allow more time for the public to become informed. Council Member Avella said he believes that DCP will approve the amendments, but because of the flawed process, he has pledged to attempt to kill the proposal in the City Council, then encourage the AIA to return to the table and start the process again from the beginning, this time with community input. However, he stressed that he cannot do this alone, and encouraged anyone interested to contact their local community board, Borough President, and City Councilperson and, if those representatives have not taken a position (which many have not), urge them to do so. The Historic Districts Council is planning to create a repository of information about this issue, so keep posted to their website for more information, including a letter of opposition written by architects and lawyers from Queens Community Board 9. When we first posted about the AIA’s proposed zoning text amendments, there was a bit of confusion about the public input process. It seems the comment deadline we announced was for the responses of community boards, and no one we spoke to knew for sure if/when the proposals would proceed accordingly through ULURP. Now that the amendments are heading to the City Planning Commission, there will be more opportunity for the public to respond, but one problem remains: people are still confused about the possible impact of the proposed changes. HDC will hold an informational meeting on January 23, where HDC President and urban planner Paul Graziano will explain the details of the proposal; and will be joined by Community Board Land Use members from Brooklyn, Queens and Manhattan – as well as Council member Tony Avella, Chair of the City Council Subcommittee on Zoning & Franchises. Details after the jump. Also, for more discussion of the proposal, please visit our wiki at the Open Planning Project. Could Formula Retail Zoning be in NYC’s Future? Options that other cities have used to limit chain retail stores include store size caps (usually only effective for banning the big boxes), community impact review requirements (in which impact studies are required for large-scale retail developments), and the aforementioned formula business restrictions. 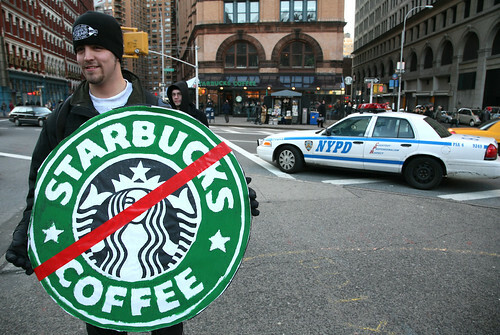 While some towns or neighborhoods choose a complete moratorium on chain stores, others require chains to alter their “formula” by designing their signage, facades, etc. to be both different from other locations of the same chain, and contextual with the surrounding neighborhood. The American Institute of Architects New York City Chapter has proposed new amendments to the zoning resolution, particularly having to do with contextual zoning regulations. Their proposals include: increasing coverage allowed on small corner lots; increasing maximum allowable base heights up to 25% to align with adjacent buildings (as shown here); and doing away with the side yard requirement in certain districts. More details are available here. The AIA says that these changes, “Allow flexibility to encourage variety and design excellence, consistent with sound planning and urban design principles.” Some neighborhood activists (particularly in Brooklyn), however, are concerned about the implications for contextually-zoned neighborhoods. These amendments are currently in the process of review by community boards, and the public comment period ends on January 7. For more information, contact mark@cplusga.com or lmanville@aiany.org.